Scientists have known about anthropogenic climate change since the 19th century (yes, climate science is that old). By the second half of the twentieth century, the scientific consensus was so strong, and the implications so concerning, that the issue broke free of scientific journals and into the mainstream. Through his worldwide industrial civilization, Man is unwittingly conducting a vast geophysical experiment. Within a few generations he is burning the fossil fuels that slowly accumulated in the earth over the past 500 million years … The climatic changes that may be produced by the increased CO2 content could be deleterious from the point of view of human beings. The United States remains committed to aggressive and thoughtful action on environmental issues. We all know that human activities are changing the atmosphere in unexpected and in unprecedented ways. We know that the future of the Earth must not be compromised. We bear a sacred trust in our tenancy here and a covenant with those most precious to us—our children and theirs. The stakes here are very high; the consequences, very significant. So what has happened in the almost thirty years since the The Pres' went to the UN and sang kumbayah? Clearly, we're missing something fundamental in addressing climate change. The philosophy emerged as a conscious attempt to reshape human life and shift the locus of power...Neoliberalism sees competition as the defining characteristic of human relations. It redefines citizens as consumers, whose democratic choices are best exercised by buying and selling, a process that rewards merit and punishes inefficiency. It maintains that “the market” delivers benefits that could never be achieved by planning. Canadian economist John Kenneth Galbraith had a pithier but memorable take on it: the modern conservative is engaged in one of man's oldest exercises in moral philosophy; that is, the search for a superior moral justification for selfishness. The existence of this oligarchic class undermines democracy in a general sense. They can use their wealth to fund political campaigns, or influence public debate, thus having an out-sized effect on policy-making. According to Piketty: capitalism automatically generates arbitrary and unsustainable inequalities that radically undermine the meritocratic values on which democratic societies are based. This matters because it is in the short term interests of the corporate oligarchy to avoid action on climate change. To curb emissions, the government has to intervene in the economy. Whether it is a market mechanism like a carbon tax, or direct investment in, say, renewable energy, it cannot allow people and companies to pollute without restriction. The market cannot be left to its own devices. But this is inimical to neoliberalism—the ideology that gave the elite their wealth and power. Where we see climate action, they see a breakdown of the order that underpins their exalted status. This is exactly the dynamic that environmental historian Jared Diamond has observed in past societies that have collapsed due to environmental reasons. He argues that societal breakdown happens when the interests of the elite conflict with the interests of the ordinary people. Other research has found correlations between inequality and environmental degradation as well. One study of 50 countries found that inequality was a strong predictor of a country's rate of biodiversity loss. Another study of all 50 US states found that the ones with greater inequalities of power had weaker environmental protections, and greater ecological degradation. Why? In Doughnut Economics, economist Kate Raworth argues that: inequality fuels status competition and conspicuous consumption... and erodes the social capital—built on community connections, trust and norms—that underpins the collective action needed to demand, enact and enforce environmental legislation. Effectively responding to climate change requires dislodging vested interests who benefit from neoliberalism, and remaking the power structures of society. But power will do anything to retain the status quo, even if it's taking us to the brink of oblivion. Climate has become a class struggle, which is why facts have been thrown out the window and debate has become so partisan. But this struggle has broader implications than those relating to climate change. The same forces that have blocked action on climate are the same forces that have, over the past few decades, attacked wages and working conditions, commodified healthcare and education, made housing unaffordable, kickstarted epidemics of obesity and depression, facilitated the resurgence of fascism and have generally retarded our sense of human decency. These effects are not limited to the poor. In their book The Spirit Level, epidemiologists Kate Pickett and Richard Wilkinson argue that: inequality damages the social fabric of the whole society. So to act on climate is to also act on health, education, inequality, plus much else besides. Likewise, when we tackle inequality, or improve teaching standards, we are also doing our bit for the climate. But to deal effectively with any of these things we have to see the links between them, and dismantle the system at the heart of it all. Yet even if we are to lance the boil of neoliberalism, there remains the question of growth: population growth, economic growth, consmption growth. The growth imperative is not unique to neoliberalism. The dominant economic doctrine before neoliberalism, Keynesianism, also required growth, though it achieved it in a different way. If we are to live within our means on the earth, we must move beyond growth. Everywhere you look in society, we are encouraged to consume more. Products are designed to stop working in a few years, and if you try to get them fixed, it will often cost you more than buying a new one. We are pressured to meet sales targets in our jobs, and rewarded with money and esteem when we do. Many marketers are paid more than school teachers—we value people who get us to buy stuff more than we value the people teaching our next generation. It is incredibly hard, as an individual, to break free of this culture when it is all around you, when you are trapped in the matrix. There are many who believe that growth is essential, inevitable, and that it is the best way to relieve poverty. Within the current short-sighted system, yes, it does smooth out some crinkles of society. But it will, if left to run its course, inevitably lead to ruin. This is because growth requires the ever-increasing consumption of resources—resources that are rapidly running out—and its attendant greenhouse emissions. It is true that our society is becoming less carbon-intensive—that is, requiring less carbon emissions per unit of economic output. But according to a paper in Nature, while the carbon intensity of our economies is expected to decrease by 1.9% per year, global per-capita GDP is expected to grow by 1.8%, thereby cancelling out almost all of the efficiency gains. A growth rate of, say, 2% may not sound like much, but it means the economy doubles in size every 35 years. A growth rate of 3% would see the economy double every 24 years. As George Monbiot puts it in another of his columns: this is not a formula for poverty relief. It is a formula for the destruction of everyone and everything. Donella Meadows, the co-author of the landmark 1972 book Limits to Growth, has described growth in even stronger terms: growth is one of the stupidest purposes ever invented by any culture. She continues: growth of what, and why, and for whom, and who pays the cost, and how long can it last, and what's the cost to the planet, and how much is enough? The key task to overcoming the problem of growth—and of neoliberalism—is to come up with an alternative economic and societal program. 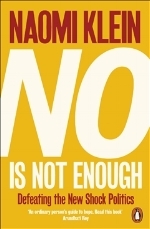 Naomi Klein has even made that idea the title of her latest book No is not enough. She argues that it is not sufficient merely to resist the many outrages of the current system (ie. to say 'no'), but we must also think boldly and imaginatively of alternatives, to articulate a vision of a kinder, fairer, cleaner future. This will inevitably be a messy and confusing process, with many ideas being thrown around—after all, we are in uncharted territory. But it is an imperative task if we are to survive this century. Of course I don't claim to be any sort of expert, but here are some of the more promising and well-thought-out ideas being put forward. Out of the Wreckage: A New Politics for an Age of Crisis. A book by progressive British commentator George Monbiot, in it he argues that we have failed to move beyond neoliberalism—despite its manifest failures—due to the lack of a compelling alternative narrative. He emphasises the role of storytelling in human understanding of the world, and develops a new story, which he calls the politics of belonging. This article provides a great summary of his main ideas. No is not enough: Defeating the New Shock Politics. A book by Canadian author and intellectual powerhouse Naomi Klein, it provides incisive and wide-ranging analysis on how we got into this situation, and how we might get out of it. Contains the Leap Manifesto. Developed by a group of prominent Canadian progressive groups and people, the Leap Manifesto calls for a Canada based on caring for one another and the planet. It's principles can be applied to any developed nation. Doughnut Economics: Seven Ways to Think Like a 21st Century Economist. A book by economist Kate Raworth, it is a comprehensive and ingenious rethinking of orthodox economic theory, and a road map of how we may restructure the economic system to meet the challenges of this century. It's based around the concept of a "doughnut of social and planetary boundaries." At its heart is the idea of providing everybody's basic needs within the environmental capacity of the planet. Let's just say your sitting on the couch watching TV, and suddenly smoke starts billowing in from the kitchen. You're not going to say: "err, I'll deal with that after this episode." Neither will you say: "well, there isn't yet sufficient evidence that my house is on fire." You definitely won't say: "there is a global green-left conspiracy that wants me to believe that my house is on fire." Your pupils dilate, your blood pressure rises, you leap off the couch and you either fight the fire or you get the hell out of there. On a planetary scale, our house is on fire. The problem is, it does not express itself in a concrete, immediate and life-threatening way like an actual house fire might. It is a large, amorphous and multi-faceted problem that burns slowly in the background, only occasionally busting into the headlines. Sure, we notice that the weather is different. We are concerned, on an intellectual level, when we read the worrying facts. But it doesn't stop us from going about our day-to-day lives in more-or-less the normal way. Our minds, having evolved over millions of years on the savannah—where various creatures might jump out and try to eat us—is designed to react to those concrete and immediate threats. And so we tend to push climate change aside and focus on things that are more real and immediate to us at this moment, like meeting that work deadline, or putting out the rubbish. The task here, when it comes to climate change, is to use our intellectual capacity to override this tendency. There are a couple of ways, as far as I can see, to do this. The first way is something that I came up with myself. It is to treat climate change like personal hygiene. If you don't, say, clean your teeth, they will soon rot away. You will be in a lot of pain, and be forking out for expensive dental work. There is a (more-or-less) immediate consequence to not brushing your teeth. You will clean your teeth even if you're tired and there's a lot going on in your life. If we can, in our minds, give climate action the same status as cleaning our teeth, it may help us to do it regularly. Have you done your climate action today, this week, this month? That regularity is what, over time, moves mountains. This crisis requires us to fold it into our everyday lives. Maintaining this motivation requires regularly engaging with climate change, and keeping it forefront in our minds. A good way of doing this is to sign up to Climate for Change's fortnightly wrap up of climate news from around the world. It includes the good news—new developments and progress—as well as the bad, and always includes some ideas of actions you can take in the coming fortnight. Climate action is also easier when you do it with other people. It doesn't have to be mournful and solitary. It can be creative, fun and social, like this Stop Adani protest in Bendigo (below) where people dressed up as bleached coral. There are plenty of local and national organisations you can get involved in. Check out this directory of Australia's climate-related organisations. The other way of getting around our instinctual tendencies is a little more dramatic, and comes from clinical psychologist Margaret Klein Salomon, founder of the US-based non-profit The Climate Mobilization. She reckons that we that we need to, en masse, go into 'emergency mode'—a psychological state fundamentally different to the one we are usually in. Emergency mode is what I described earlier with the example of the house fire. When your house is on fire, your whole world becomes dealing with that fire. You enter a heightened state. All other priorities take a back seat, and you expend any and all resources available to you at that time to deal with that problem. If the only thing you have to smother the fire is that expensive rug that you really like, you will do it because you know that the rug is no use to you if you're dead. It is possible for whole nations to go into emergency mode, and war provides the clearest examples. When the United States was attacked by the Japanese at Pear Harbour in 1942, they went into emergency mode. With strong government direction, they turned their economy on a dime, and within months were pumping out mind-boggling amount of war equipment—planes, tanks, munitions—from factories that had previously produced cars. Virtually all available resources went into the war effort. One of the defining characteristics of emergency mode is that it's contagious, one way or the other. If someone is lying down on a crowded train platform, often we look to other bystanders to assess the seriousness of the situation. If the bystanders are behaving as usual, we assume that nothing bad is happening, even if the person on the ground has, say, had a stroke. But if other people are in emergency mode—assisting the person and calling an ambulance—then we will follow them into emergency mode, and try to help in any way we can. A similar dynamic is at play with climate change. Our leaders and our media are not in emergency mode. Probably most of the people we know are not in emergency mode. Our subconcsious mind takes note of this and tells us that it can't be that that bad—but the planet is having a stroke. The Climate Mobilization has a plan to harness this quirk of human psychology, and to use the US response to World War 2 as the inspiration for a total and rapid transition—within a decade—away from fossil fuels. Like they pumped out tanks and planes in the past, we could pump out turbines and solar panels, and every other piece of infrastructure needed to make the great transition. Like they used almost all available resources defeating the axis powers, we could use almost all our resources to, you know, save our friggin' home. It is unashamedly an emergency response, and certainly high-ambition, to the point where many will say that it's not politically realistic. The problem is, with climate change, anything that's "politically realistic" is not actually realistic in the physical world. It may seem impossible, but—and here's the thing—we don't actually have a choice, if we want to avoid catastrophic climate change. Neoliberalism has stunted our imaginations. It has undermined our faith in our collective power. It has been largely successful in convincing us that there are no alternatives to its narrow dogma. Yet if we want a shot at preserving a liveable planet, we have to look way past 'gradualist' measures within a neoliberal system. We have to think big. We have to do the 'unrealistic,' the 'improbable,' even the 'impossible.' We have to be heroic. This is the challenge of our generation. In this half-hour video, The Climate Mobilization founders Margaret Klein Salomon and Ezra Silk go into detail about their movement, and touch on a number of the points I've made in this series of posts. It's a really engaging and meaningful interview, which I'd highly recommend watching. Some observant readers might have noticed a contradiction in the arguments I've made on this page. On the one hand, I've said we need to move beyond a growth-based economy, on the other hand, that we need a WW2-style response in order to transition away from fossil fuels. A WW2-style response would entail a revival of what might be called military Keynesianism, and involve massive government stimulus, increased production and yes, economic growth. So how do we reconcile these two ideas? It's in the timing. Quite simply, we need to do one thing, and then the other. We need that rapid, WW2-style transition, which may temporarily increase emissions as we build the new infrastructure, but which will then lower emissions rapidly as that infrastructure comes online. And whilst this transition is happening we need to be thinking about and discussing what the new economy and politics will look like once that transition is coming to completion, so that when the it's over there is something sustainable ready to replace it. Here's the process, in a nutshell. Sounds neat ha? But can it really happen in time? Is there really cause for hope? Ultimately that's for each of us to decide. The thing about social and political change, though, is that it's non-linear. Research has shown that change doesn't happen steadily and predictably, but that it is often sudden and unexpected. It's like a damn failure, where pressure builds up quietly over time, before something gives way and the water bursts forth. It can be expressed visually like this. So how far away are we from this tipping point? Nobody knows, but it's clear that large cracks have already appeared in the neoliberal artifice. Widespread dissatisfaction with establishment politics is growing. 'Socialist' candidates such as Bernie Sanders and Jeremy Corbin are finding popular support. And just the other week, an estimated 100,000 people marched through Melbourne CBD to stand up for worker's pay and conditions, the largest such rally in a generation. The damn may be about to burst. If you’re inspired to take action, you may want to read this post about the inaugural Climate Cycle to Canberra. In it I’ve created a list of concrete actions which I believe will be most effective in creating the change I’ve described. Note: some of the book links on this page are affiliate links, meaning that if you buy something through them, you're helping to support Adventure Cycling Victoria.